Year of October is a blues rock band based in Nashville, TN. 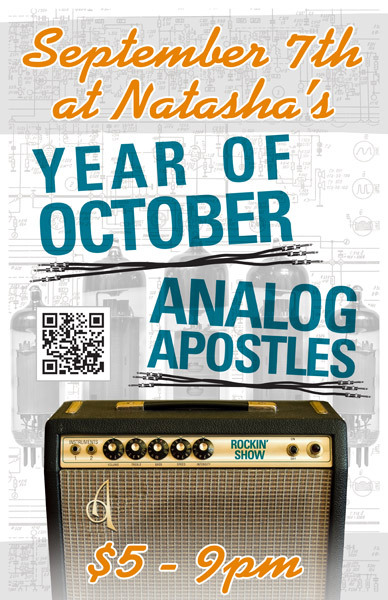 I designed this 11×17″ concert poster art for a show with my band at the time Analog Apostles. The gig took place at the now defunct Natasha’s Bistro and Bar here in Lexington, KY. I had a lot of fun incorporating both of my loves, graphic design and music, into this composition. I themed the poster around a vintage Fender silverface tube guitar amp, which is similar to the ’78 Fender Twin Reverb I once owned. First of all, I replaced the Fender logo over the speaker grill cloth with AA’s “A” insignia. I added a shiny chrome effect and embossed it to mimic the original element. I also Photoshopped out the blue amp model name, and then replaced it with the words “Rockin’ Show” in a similar font. Guitar gearheads appreciated the attention to detail I added to this concert poster art. As for the text, I used a sans serif font in turquoise for the band names, while choosing a fat script colored orange for the other information. The band name titles are colored similar to the amp name, and also use the same font. I “underlined” both bands’ names with sets of unrolled guitar cables. The orange script almost has a neon signage feel. Finally, I overlaid a set of vacuum tubes on top of the amp schematic drawing in the background. I changed their colors to black and white to make the colors in the forefront pop. Because of this, these images come together to make the perfect background arrangement. I almost hid them in effect, but if you take the time to examine them, they really add to the whole package. Do you have a big show coming up and need poster graphic design that stands out? Contact me today.